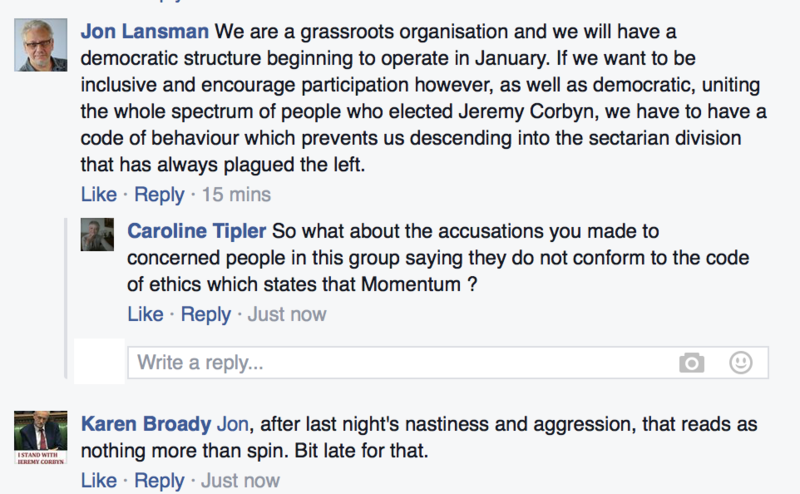 Last week a leak from Momentum revealed that Jon Lansman needed to discipline Momentum activists after some inappropriate behaviour. This was not an accurate representation of what occurred. 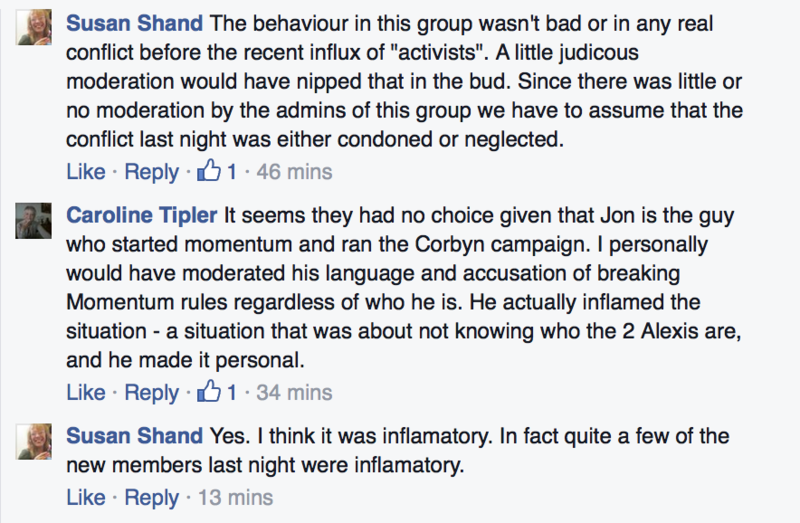 Instead activists confronted Lansman and ‘senior representatives’ in Momentum after being subject to bullying and intimidation. It’s likely that the ‘leak’ in the press came from Lansman himself in an effort to avoid the truth coming out. Organisers are upset and angry. These events have revealed a lack of experience and expertise in handling the responsibility of an important political role. 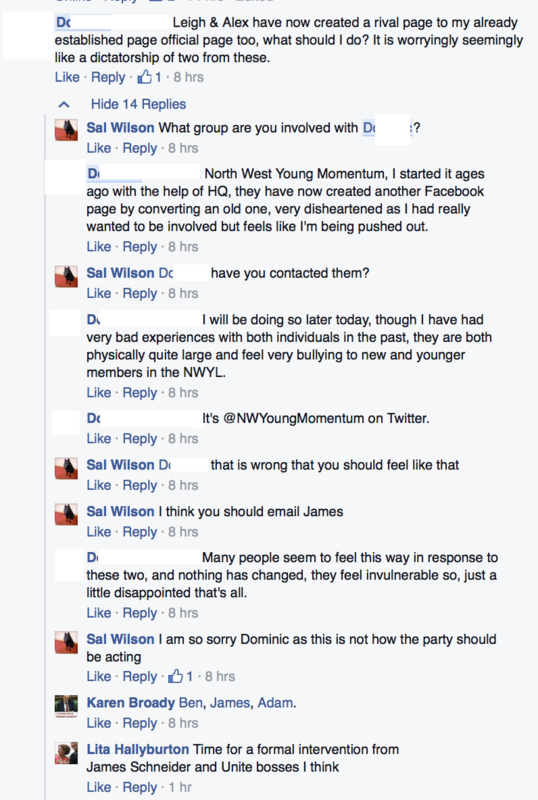 Within this document we will provide evidence of bullying of Momentum Organisers, bullying of a young activist and a failure to investigate this bullying, and of an organisation that is not what it appears. We care strongly about Momentum and want to see it be used as a democratic organisation to allow ordinary party members to get involved with the Labour Party. Prior to these events, we assumed that those in charge were acting responsibly and with the best intentions for Labour Members - and trusted them with the responsibility of setting the direction of Momentum. Considering some of the abusive behaviour by Jon Lansman some of his associates and failure to investigate allegations of bullying, we are concerned of their ability to represent members in Momentum. After Momentum was announced groups popped up all around the UK by activists keen to get involved in their communities. People started Facebook pages and began organising meetings. A group of organisers got in touch with the headquarters in London and began to coordinate their efforts. A system was set up by grass-roots organisers whereby Momentum groups were required to ‘register’ with the Headquarters in London to be official (and to avoid rogue Momentum groups misrepresenting the organisation). Representatives from HQ were present during these discussions on national organisation. These representatives included some of the faces you have seen in the media discussing Momentum (eg. James Schneider). 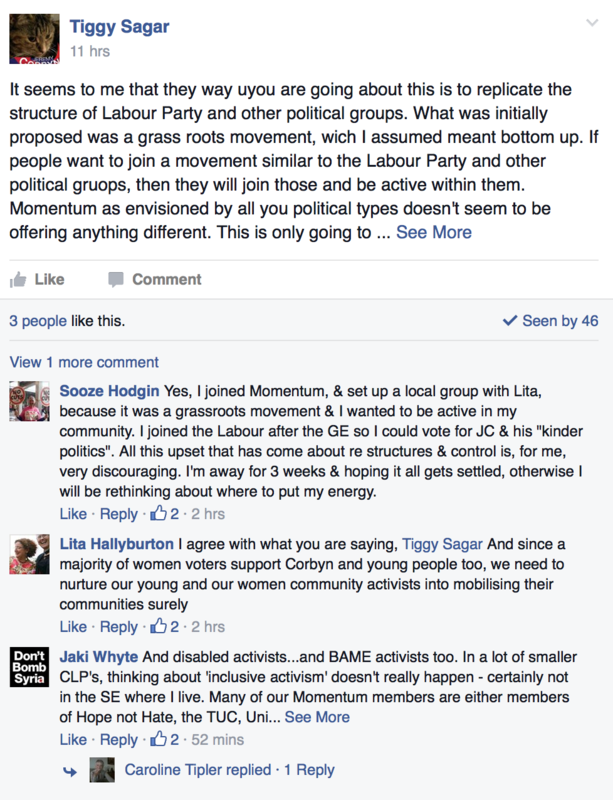 Often discussions took place in a Facebook group where Momentum organisers discussed ideas for leaflets and campaigns to run locally. 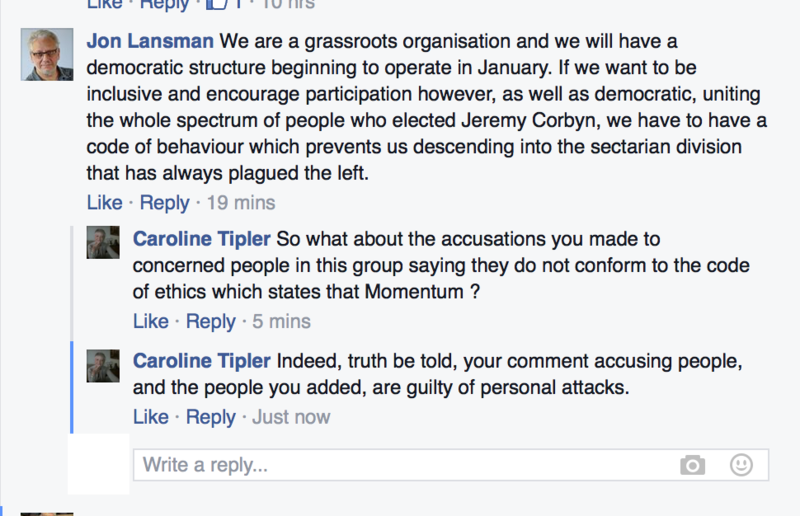 In Dec, people started reporting that a number of individuals had began taking over Momentum Facebook Pages. 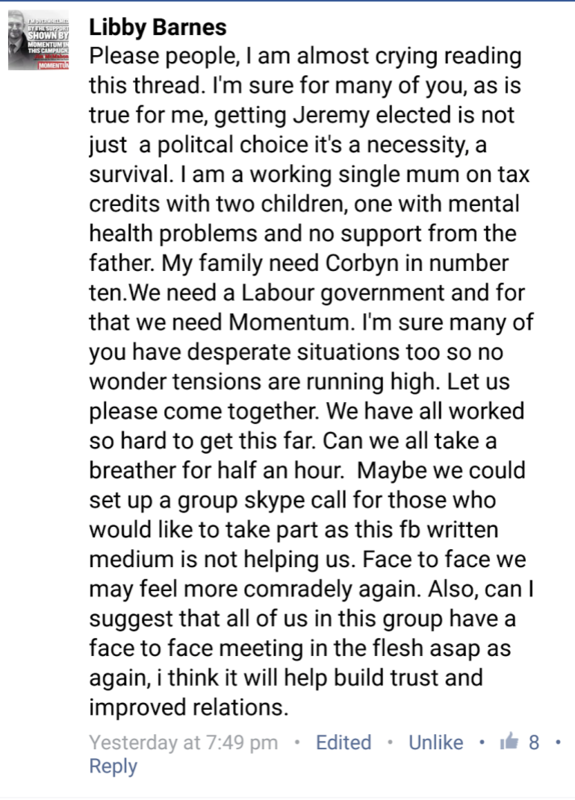 Some of the people organising through Momentum were new to the getting involved in organising, worked full time and did some activism on the side, or needed support - so additional help was gladly received. A group of individuals would offer help, and then would remove all other people from administrative roles on the pages. Repeatedly the name Alex Elhrich and Alex Halligan came up - we didn’t know who these people were. 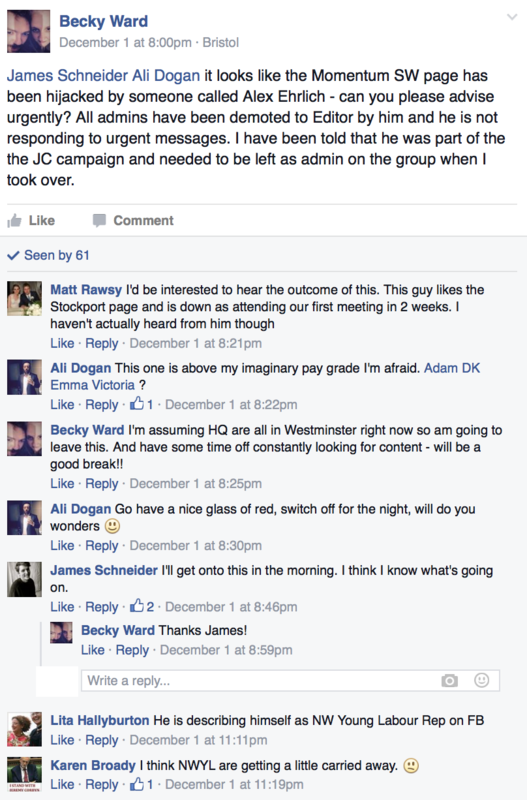 James Schneider was consulted by organisers to some success - Momentum Bristol managed to get their page back from these individuals. However, many pages are still under their control. It was also discovered that these individuals had gained access to all Momentum Youth pages, and were bulk posting the same posts on all social media accounts. 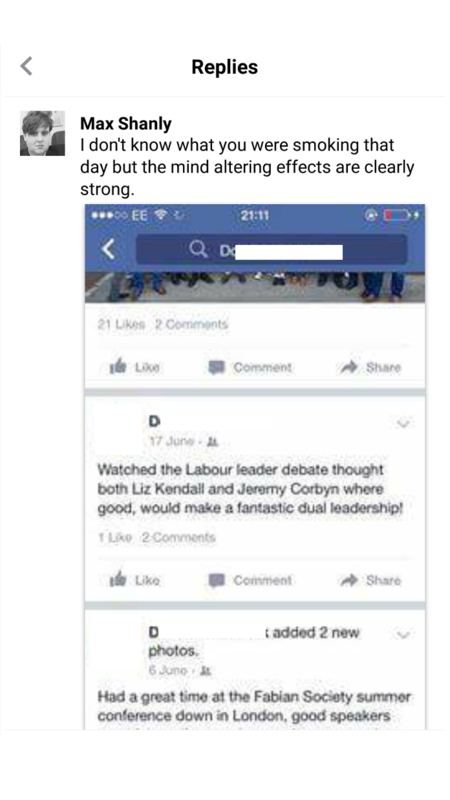 One young Labour member had established a youth page for Momentum. 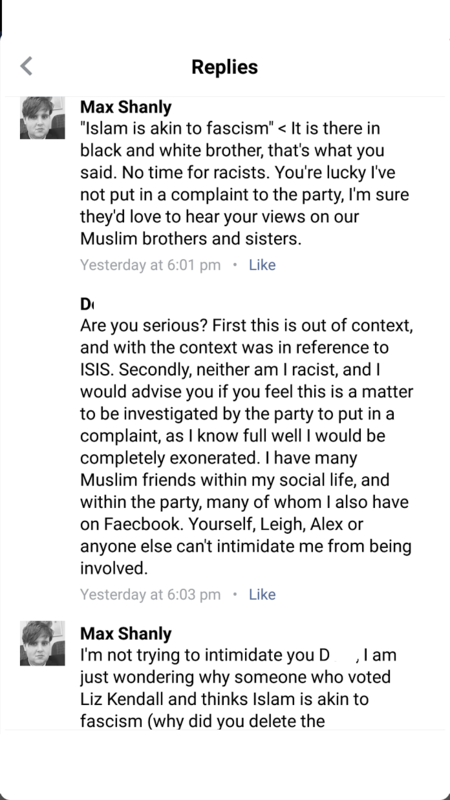 They reported to other organisers that they had been subject to intimidation by Alex Halligan and Cllr. Leigh Drennan in order to relinquish the page. For the members anonymity, they are referred to as ‘D’ in the comments below. As we were not familiar with these people or their motives, there was increasing concern amongst Organisers about the agenda of these individuals taking over pages. James Schneider also reported that he was not aware of what was occurring and was attempting to fix the situation. Alongside this there were increasing reports of individuals being subject to defamation when attempting to organise and get involved in Momentum. 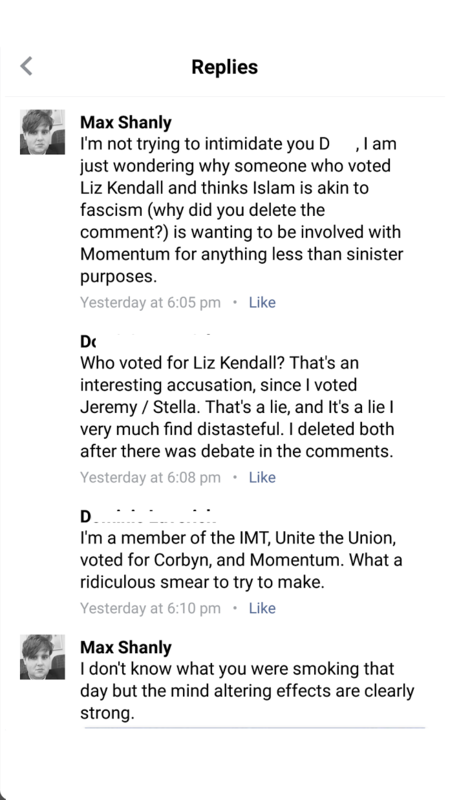 Some were blocked from Facebook pages after attempting to contact about setting up their own local branch for Momentum, others were subject to attempts to discredit them by spreading associations with ‘hard left’ groups like the SWP or Communist Party. Others were accused of infiltrating in order to undermine Momentum for Progress. In our experience - individuals that we came across were just trying to organise in their community, give out leaflets and get more people involved in the Labour Party. Other allegations were made about Halligan and his friends harassing and intimidating members, but these are not supported with evidence and so we will not discuss them here. 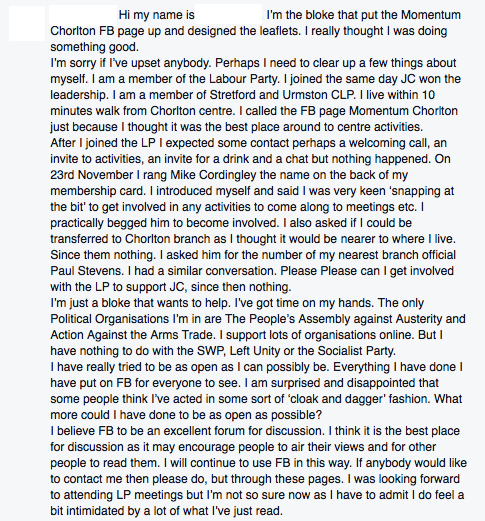 One individual was accused of acting in a ‘cloak and dagger’ fashion after setting up a Momentum Chorlton page. 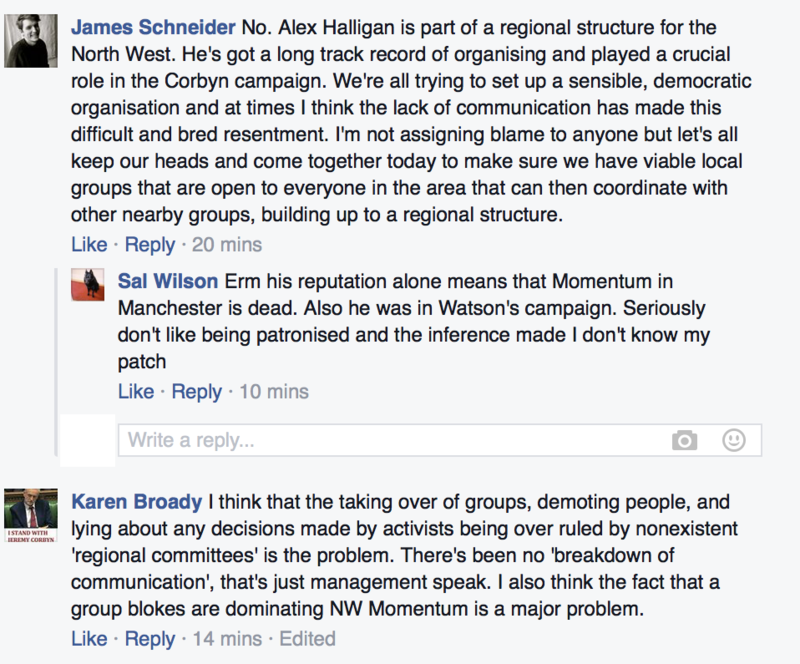 In Mid December, the organisers became aware that Alex Halligan had been appointed as a formal organiser for Momentum by Jon Lansman. The take over of Facebook Pages had been a coordinated attempt to regain control over these pages. Alex Elhrich and Alex Halligan appeared to share a Facebook page. On hearing of this news, Organisers were concerned on the appointment of this individual into a senior role considering his lack of previous consideration for organisers who had spent time building local support. As other senior roles were made public, concern was also raised that these posts were all filled with white men, appointed on their connections rather than expertise. Questions were also raised about equal opportunities. As Momentum is funded through crowd sourced money, we wanted to ensure that this money was spent properly. 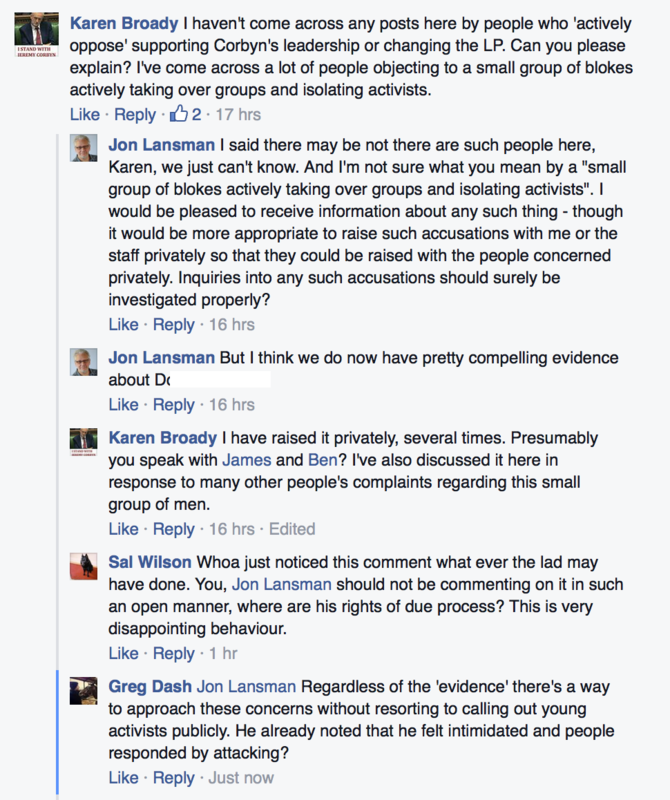 On reading these criticisms, Jon Lansman added a number of individuals into an online discussion. 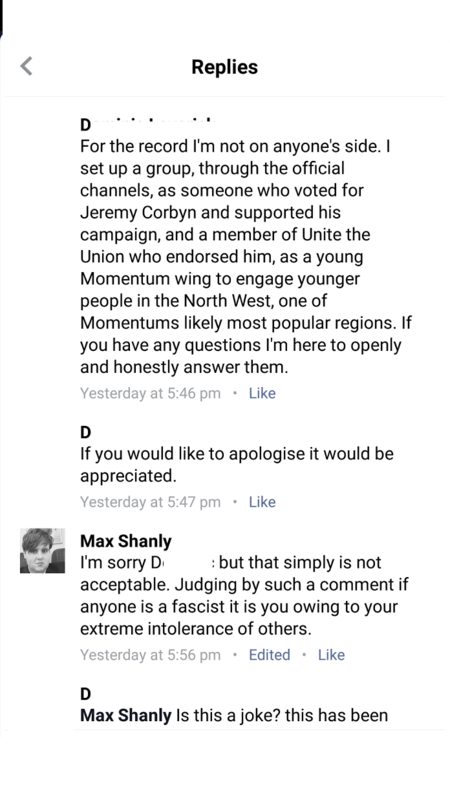 Many of us were not aware of who these people were (some of us had only recently started to get involved in the Labour Party again after a long hiatus), and had only heard of Alex Halligan, Samuel Wheeler, Max Shanly, etc through the complaints raised by Momentum Organisers. Not reported in the telegraph were the responses from Organisers, where people accused Lansman of ‘spin’ and attempting to intimidate organisers through the individuals he added. 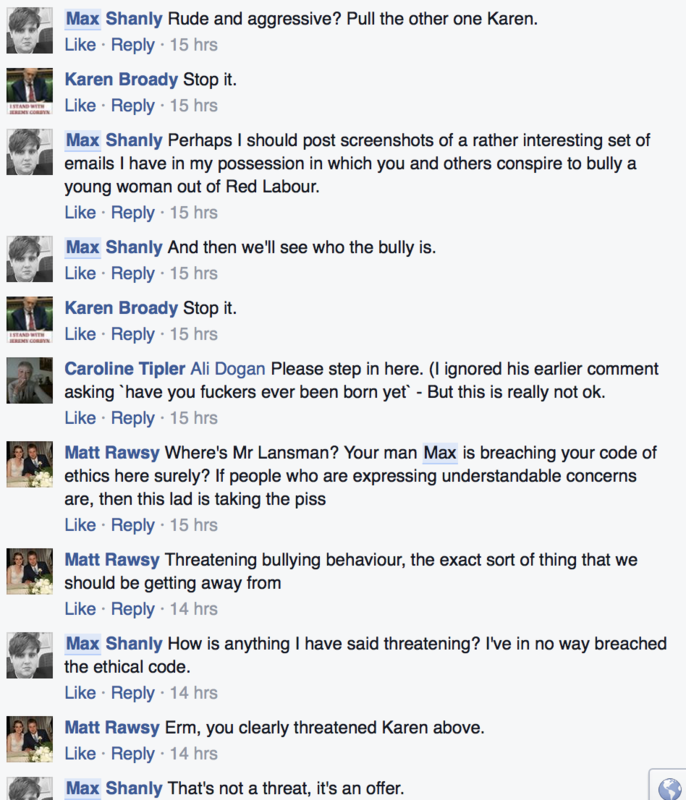 These responses were met with further abuse of Lansmans friends. The complaint from the young activists about intimidation was ignored and dismissed by Lansman and his friends and instead they attempted to discredited the young activist by claiming that he was a Liz Kendall supporter attempting to undermine Momentum. 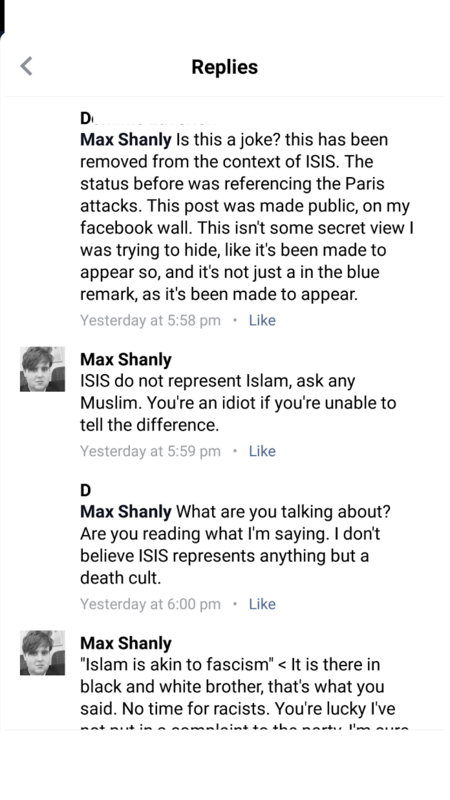 Sam Wheeler posted a screenshot of a comment he made that propertied to show Islamophobia. They threatened to report him to the Labour Party for Islamophobia if he went public with the comments made to him or spoke to the press. Regardless of an individuals political affiliation with the Labour Party, Organisers felt that this allegation should be investigated and not dismissed by Lansman and his friends. Other organisers also pushed Lansman to investigate the accusation of intimidation, but he continued to dismiss the complaints from the Young Activist. In a statement to the group, Halligan echoed Lansman’s comments. Some of the organisers attempted to reconcile with Alex Elhrich and Jon Lansman, believing that their intentions had been misconstrued. Others were angry and stated that they did not want to get involved in the party any longer, accusing organisers of misleading members about Momentum. Organisers were upset. 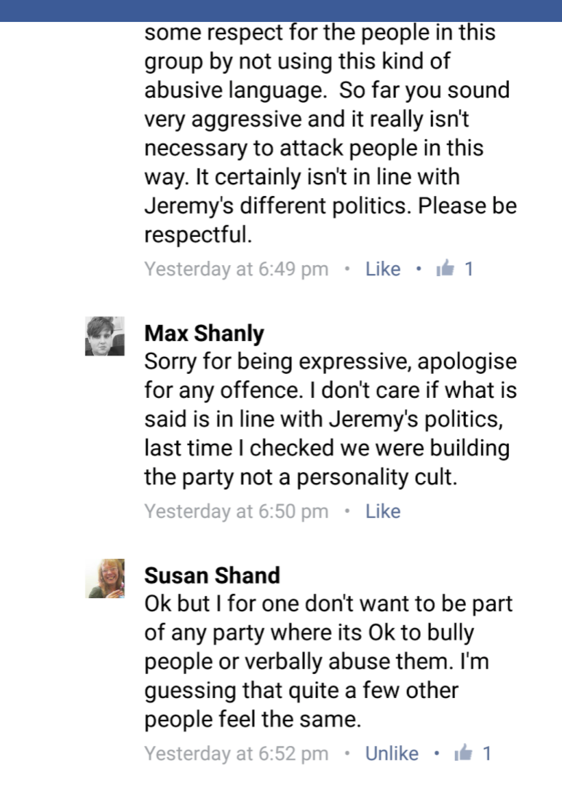 Elhrich, Shanly and Lansman however remained silent and refused to talk to organisers. The conversation was then stopped after an announcement that some of the information had been leaked to the press. The article in the Sun and Telegraph appeared shortly afterwards - entirely missing the points raised by activists and suggesting that Lansman had stepped in to address unruly behaviour. 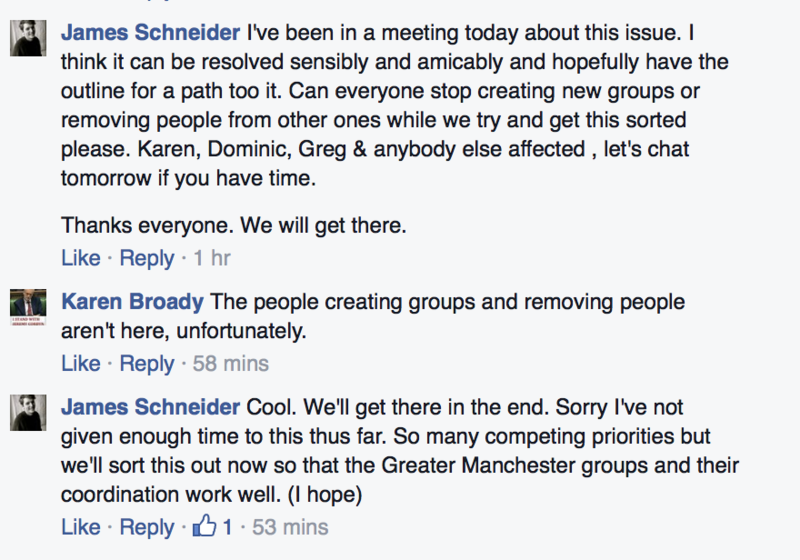 Organisers are now no longer involved in discussions about Momentum - and a small group of individuals appointed by Lansman continue to set the agenda. The above events raise concerns on the experience of these people to deal with complaints and organisational duties - or highlights an agenda that is more focused on self-promotion than grassroots activism. Either of which could undermine the hard work that activists are putting in to help get a Labour win in 2020. When the abuse began we leaked information to the press. They were not interested. We sent an email to Ben Riley-Smith outlining what had happened. Instead he reported the story above that appears to paint Lansman in a far better light. We have since contacted Ben to enquire on this, with no response.